Ayutthaya Kayaking Experience [AKE] is a sporting branch of Ayutthaya Historical Research. 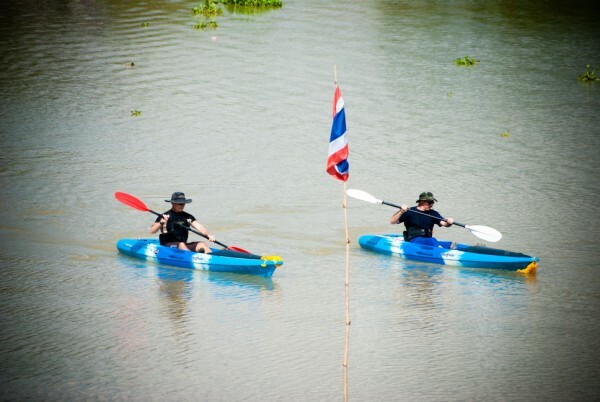 AKE’s objective is to promote kayaking tourism in Ayutthaya, by having a kayak presence on the canals and rivers. Kayaking is the perfect outdoor recreation to explore the City Island and its surroundings. Glide your way down the Ayutthayan canals and its gentle tidal rivers, between lush verdant forest and ancient monasteries; a perfect opportunity for birding and observing wildlife. On this website you will find multiple-days kayaking events organized occasionally by AKE for its members, mostly local expatriates. Any visitor to Ayutthaya, with either some kayaking experience or enough sportive stamina, interested in kayaking with us is welcome (See the tab “Contact us”). Ayutthaya is represented by the elephant mother and her calf (a lot of these baby elephants are born in Ayutthaya every year) and the well known landmark of the city - the three chedi of Wat Sri Sanphet. A kayaker is looking at the elephants on the Lopburi River bank at sunset. The logo is made in three colors, being the colors of the Thai flag; blue for the water, red for the sun and white for the peace and tranquility we find on the waters. We go with the flow!